What's another URL among friends, Facebook? ...to randomly change the ground under your feet. Of all the things which are important to your business' web presence, the addresses people use to find you is near the top of the list. Lose your URL and you can become invisible. However, URLs pose another problem which most businesses don't take into consideration: the fact that you can have too many URLs for the same web property. And now it seems that Facebook has decided to give your business page one more. If you're like most companies, you probably stashed that first URL in one or more spreadsheets your business uses to inventory your web properties. Hopefully, you replaced that original URL in your spreadsheet with the new vanity URL but what about every other place someone from your business might have used that old URL? For example, did someone put that old URL on a Twitter, Google+ or Youtube profile? It is likely you have more than one URL floating around inside your business or out "in the wild," and people will find them and use them. Even if you replaced the old URLs in your spreadsheet with the new URLs, there's a good chance some are going to creep back in any time you do a social media audit. 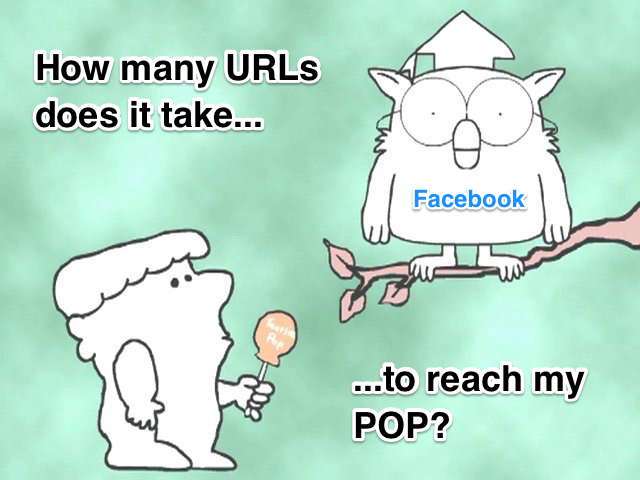 So, that means you have at least three URLs which could reference your POP. So, one point-of-presence for a product, brand, or store on Facebook can have at least four (4) URLs which may be used, one way or another, to identify it. If your company has a different presence for a brand in every location (e.g. neighborhood, city, state, country) or language, then you just got a few hundred (or a few thousand) more URLs to manage! One way to mitigage the implications of this change is to ensure each of your pages has a vanity url. Facebook has a page where you can claim a vanity URL for any page you manage and claiming yours is worth the effort. Finally, there's LinkedIn but that's a topic for another article. So, you can try to keep this all straight manually but the best solution is to use a web presence manager which will automatically identify, track and resolve any duplicates because some platform decided to change the way your web properties are addressed.